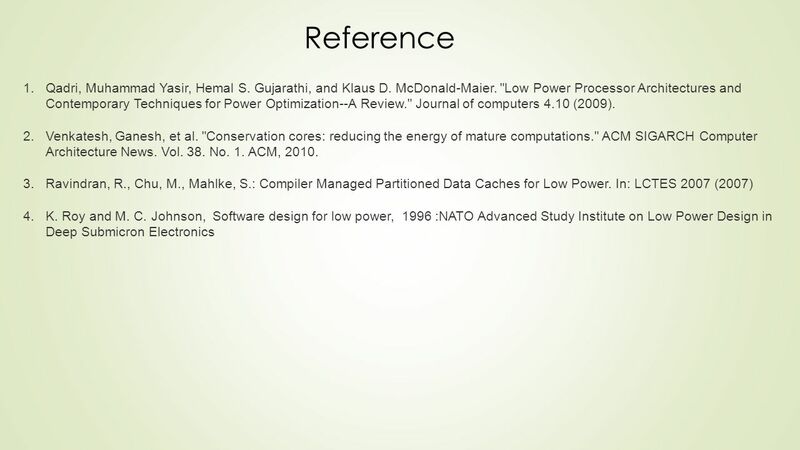 ECE 260C – VLSI Advanced Topics Term paper presentation May 27, 2014 Keyuan Huang Ngoc Luong Low Power Processor Architectures and Software Optimization. 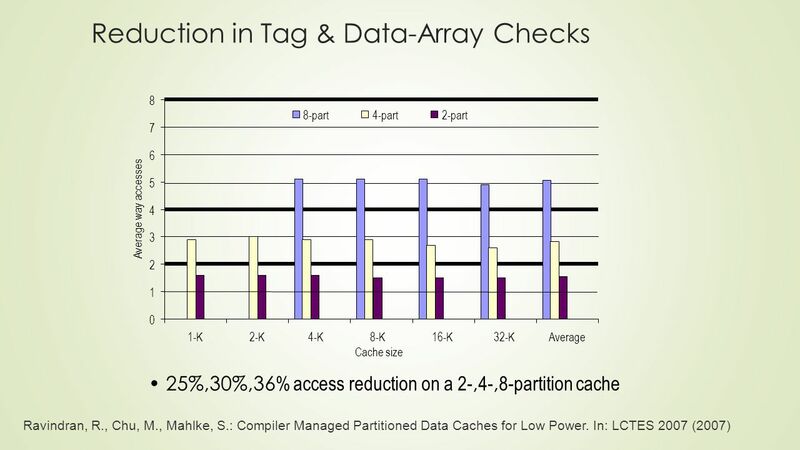 3 Low Power Architectures Overview  Asynchronous Processors  Eliminate clock and use handshake protocol  Save clock power but higher area  Ex: SNAP, ARM996HS, SUN Sproull. 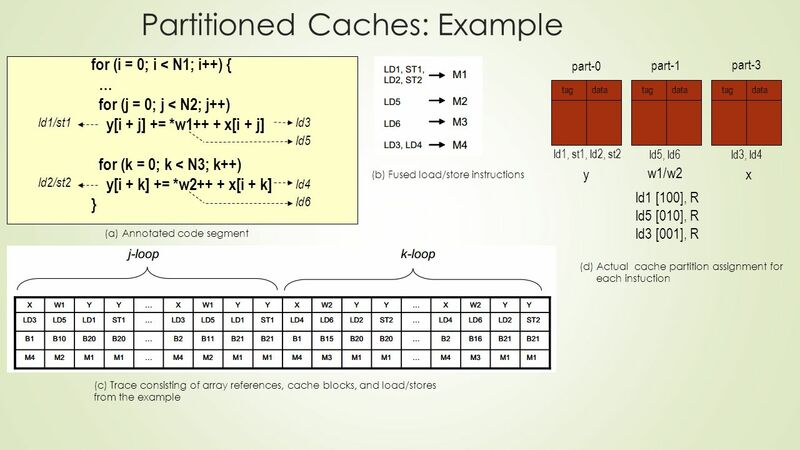  Application Specific Instruction Set Processors  Applications: cryptography, signal processing, vector processing, physical simulation, computer graphic  Combine basic instructions with custom instruction based on application  Ex: Tensilica’s Extensa, Altera’s NIOS, Xilinx Microblaze, Sony’s Cell, IRAM, Intel’s EXOCHI  Reconfigurable Instruction Set Processors  Combine fixed core with reconfigurable logic (FPGA)  Low NRE cost vs ASIP  Ex: Chimaera, GARP, PRISC, Warp, Tensilica’s Stenos, OptimoDE, PICO  No Instruction Set Computer  Build custom datapath based on application code  Compiler has low-level control of hardware resource  Ex: WISHBONE system. Qadri, Muhammad Yasir, Hemal S. Gujarathi, and Klaus D. McDonald-Maier. 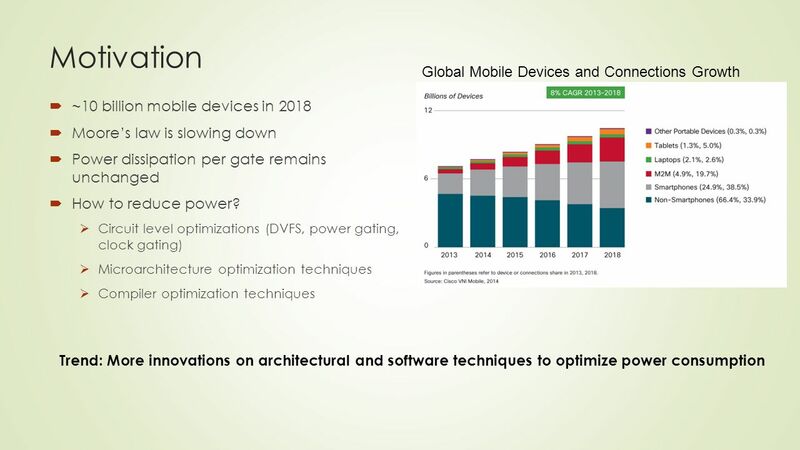 "Low Power Processor Architectures and Contemporary Techniques for Power Optimization--A Review." Journal of computers 4.10 (2009). 4  Combine GP processor with ASIP to focus on reducing energy and energy delay for a range of applications  Broader range of applications compared to accelerator  Reconfigurable via patching algorithm  Automatically synthesizable by toolchain from C source code  Energy consumption is reduced up to 16x for functions and 2.1x for whole application Venkatesh, Ganesh, et al. "Conservation cores: reducing the energy of mature computations." 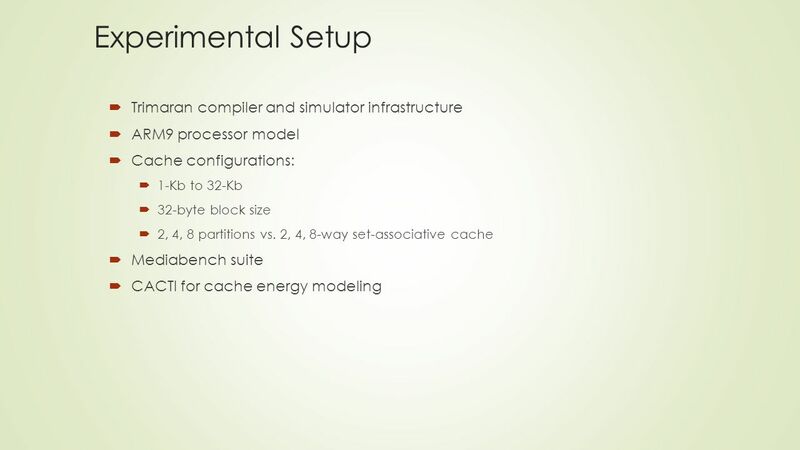 ACM SIGARCH Computer Architecture News. Vol. 38. No. 1. ACM, 2010. 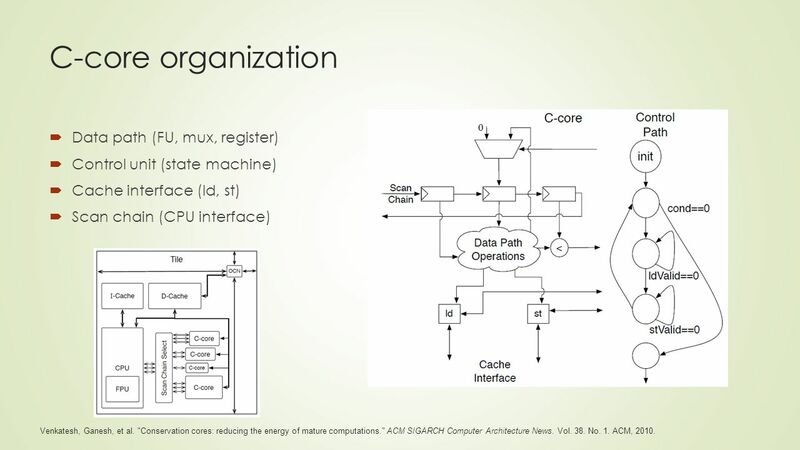 5 C-core organization  Data path (FU, mux, register)  Control unit (state machine)  Cache interface (ld, st)  Scan chain (CPU interface) Venkatesh, Ganesh, et al. "Conservation cores: reducing the energy of mature computations." 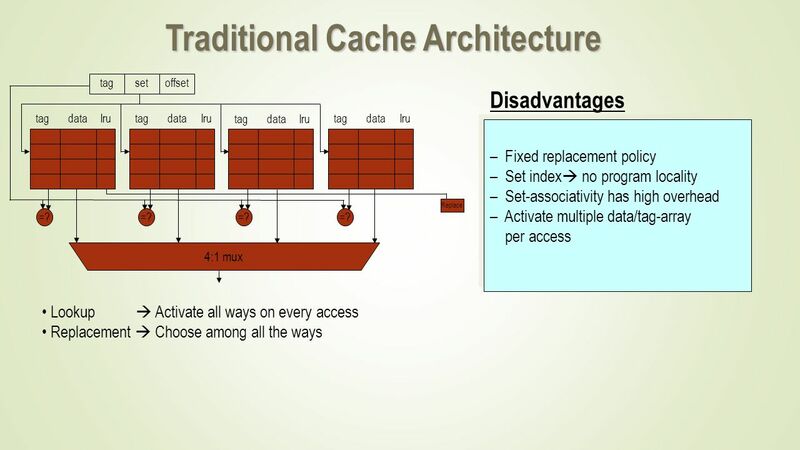 ACM SIGARCH Computer Architecture News. Vol. 38. No. 1. ACM, 2010. 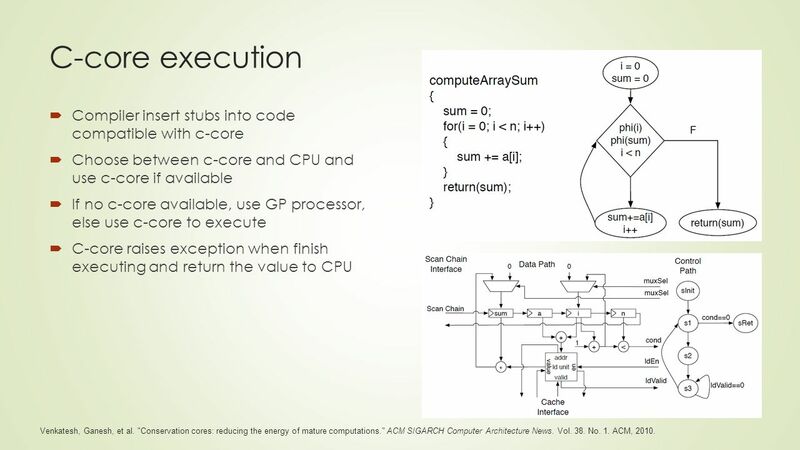 6 C-core execution  Compiler insert stubs into code compatible with c-core  Choose between c-core and CPU and use c-core if available  If no c-core available, use GP processor, else use c-core to execute  C-core raises exception when finish executing and return the value to CPU Venkatesh, Ganesh, et al. "Conservation cores: reducing the energy of mature computations." 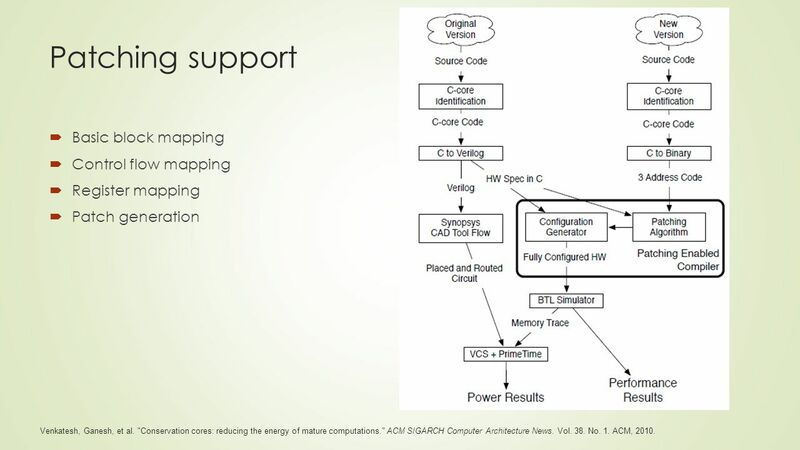 ACM SIGARCH Computer Architecture News. Vol. 38. No. 1. ACM, 2010. 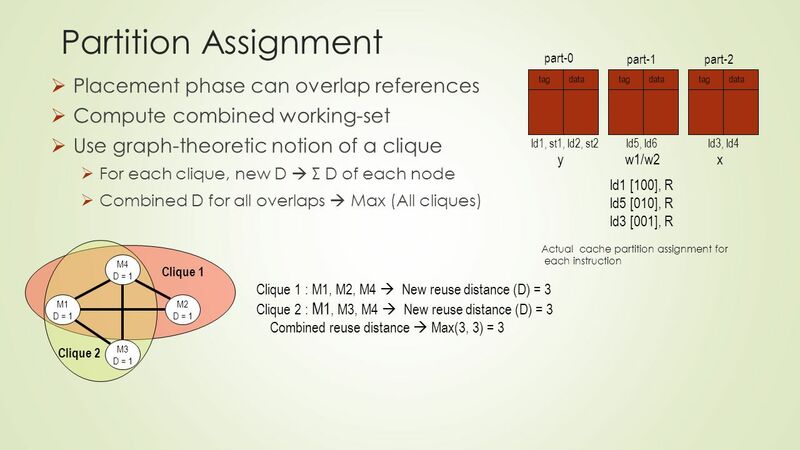 7 Patching support  Basic block mapping  Control flow mapping  Register mapping  Patch generation Venkatesh, Ganesh, et al. "Conservation cores: reducing the energy of mature computations." ACM SIGARCH Computer Architecture News. Vol. 38. No. 1. ACM, 2010. 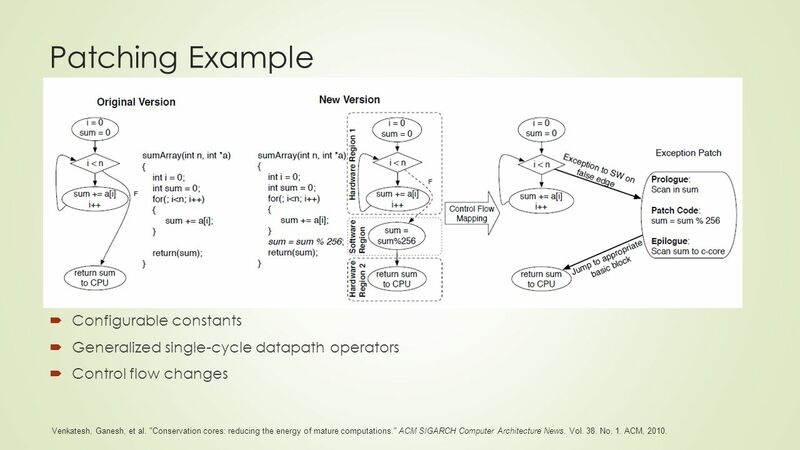 8 Patching Example  Configurable constants  Generalized single-cycle datapath operators  Control flow changes Venkatesh, Ganesh, et al. "Conservation cores: reducing the energy of mature computations." 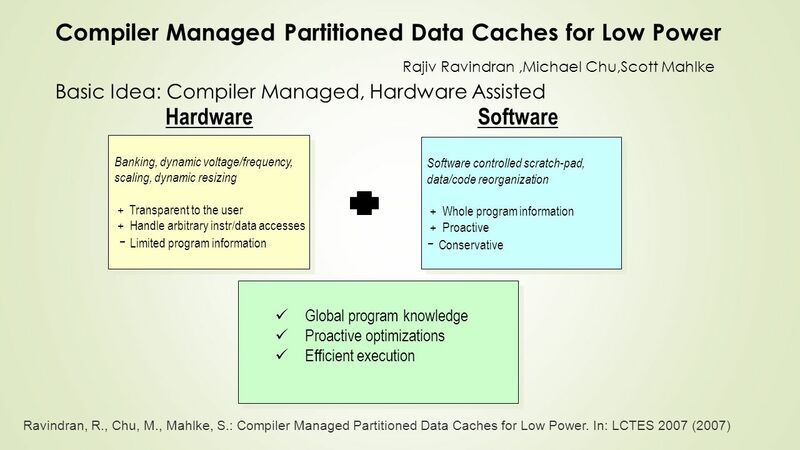 ACM SIGARCH Computer Architecture News. Vol. 38. No. 1. ACM, 2010. 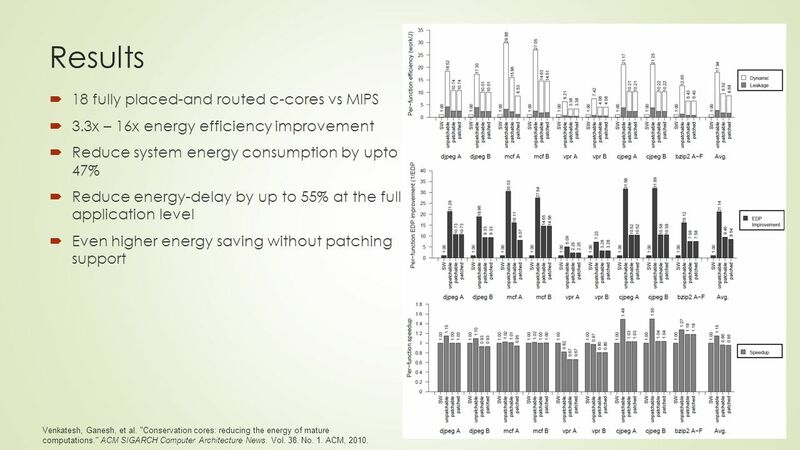 9 Results  18 fully placed-and routed c-cores vs MIPS  3.3x – 16x energy efficiency improvement  Reduce system energy consumption by upto 47%  Reduce energy-delay by up to 55% at the full application level  Even higher energy saving without patching support Venkatesh, Ganesh, et al. 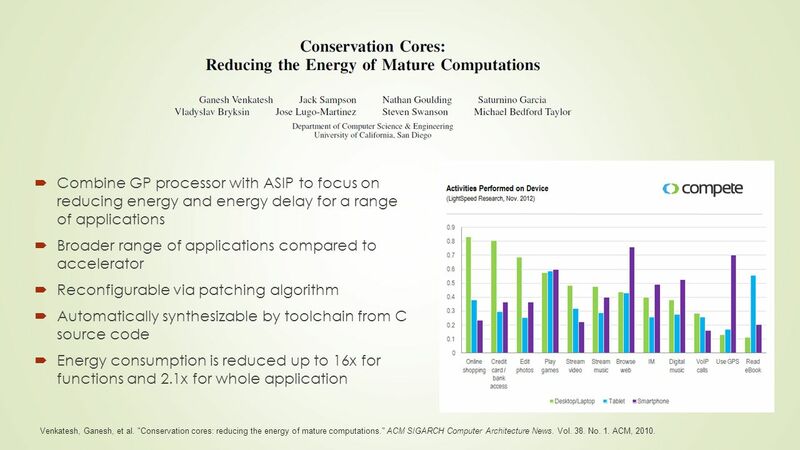 "Conservation cores: reducing the energy of mature computations." ACM SIGARCH Computer Architecture News. Vol. 38. No. 1. ACM, 2010. 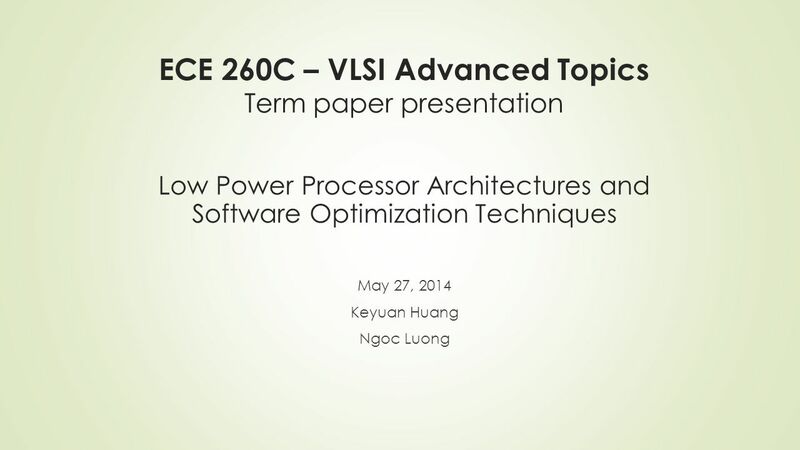 Download ppt "ECE 260C – VLSI Advanced Topics Term paper presentation May 27, 2014 Keyuan Huang Ngoc Luong Low Power Processor Architectures and Software Optimization." 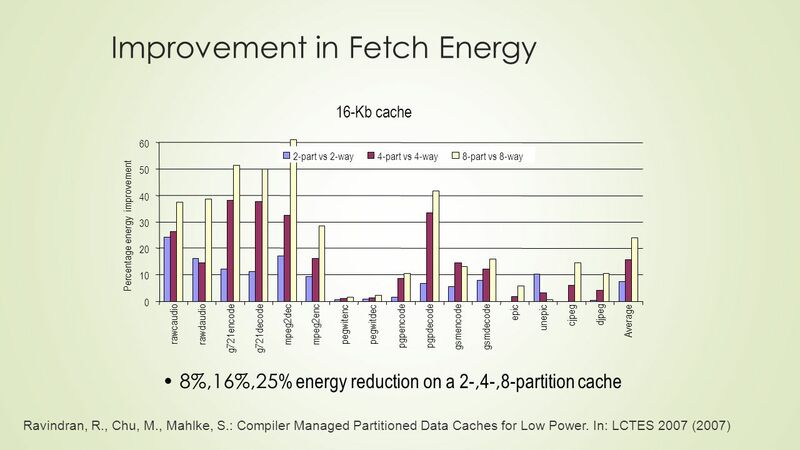 Compiler Support for Superscalar Processors. Loop Unrolling Assumption: Standard five stage pipeline Empty cycles between instructions before the result. 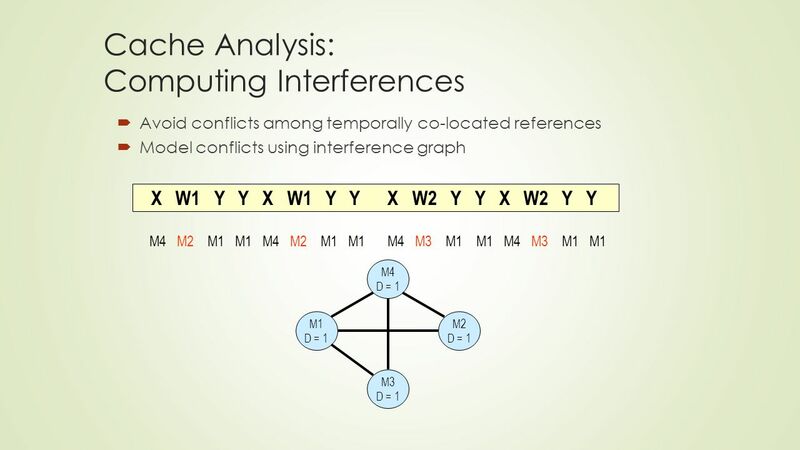 University of Michigan Electrical Engineering and Computer Science 1 Application-Specific Processing on a General Purpose Core via Transparent Instruction. 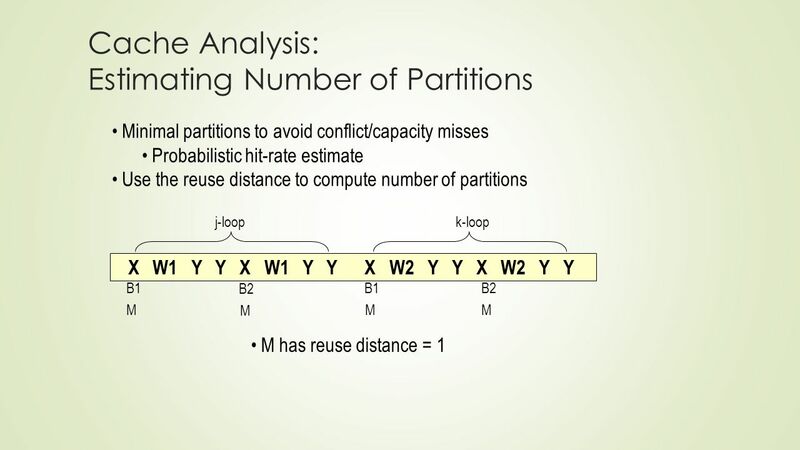 Thread Criticality Predictors for Dynamic Performance, Power, and Resource Management in Chip Multiprocessors Abhishek Bhattacharjee Margaret Martonosi. 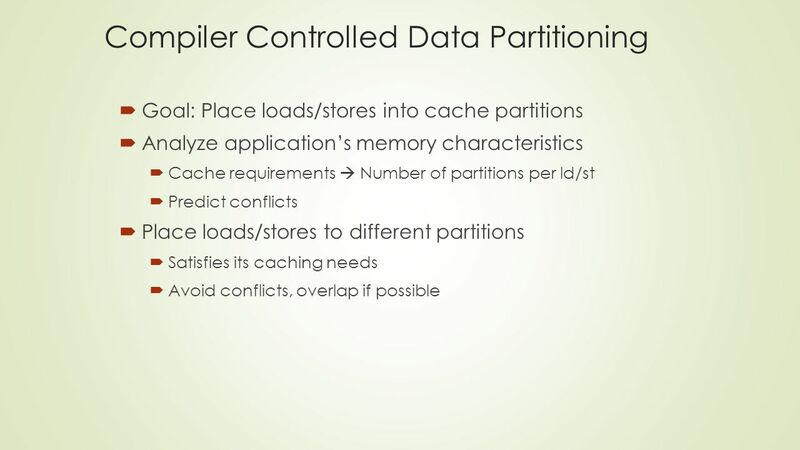 Rung-Bin Lin Chapter 4: Exploiting Instruction-Level Parallelism with Software Approaches4-1 Chapter 4 Exploiting Instruction-Level Parallelism with Software. 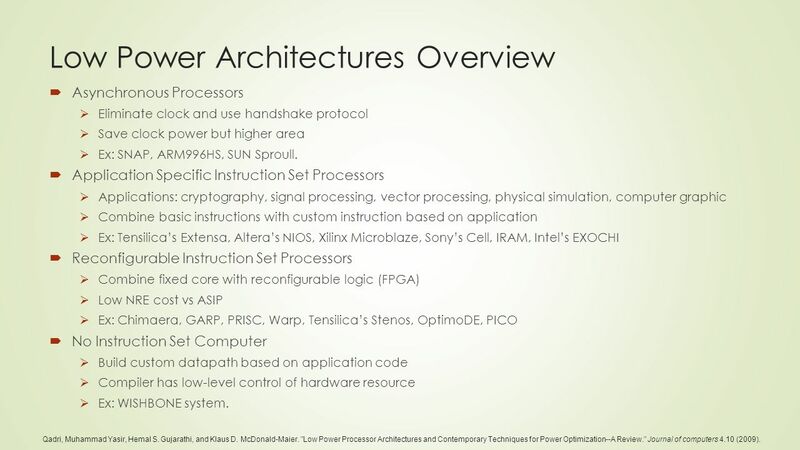 Extensible Processors. 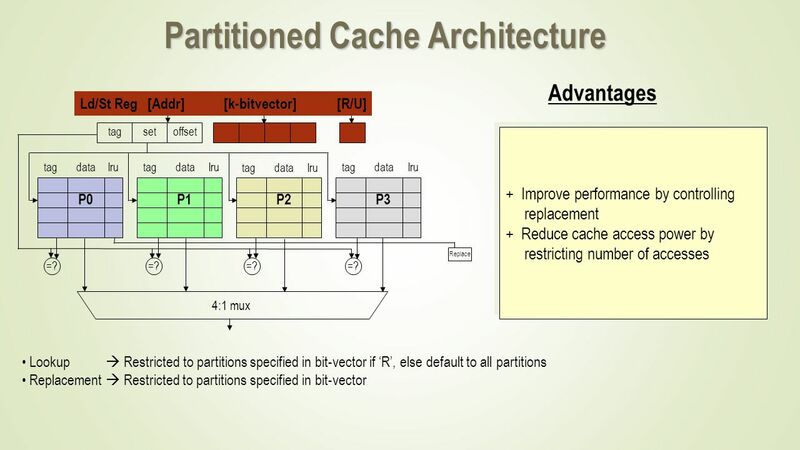 2 ASIP Gain performance by:  Specialized hardware for the whole application (ASIC). −  Almost no flexibility. −High cost.  Use. 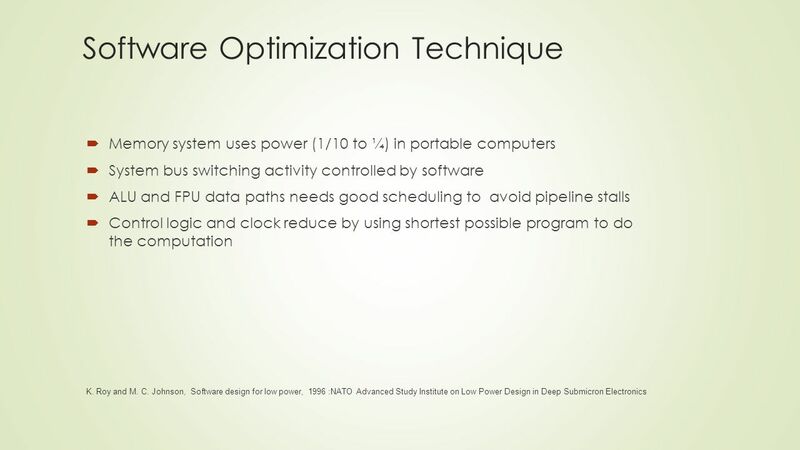 University of Michigan Electrical Engineering and Computer Science 1 Increasing the Number of Effective Registers in a Low-Power Processor Using a Windowed. 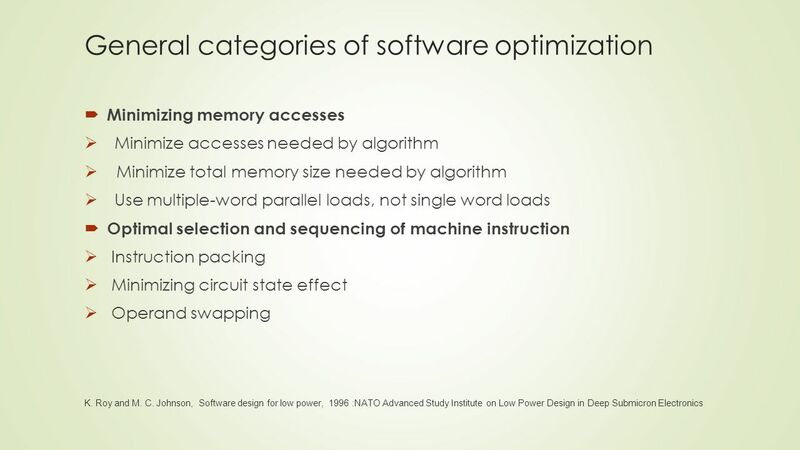 Spring 08, Jan 15 ELEC 7770: Advanced VLSI Design (Agrawal) 1 ELEC 7770 Advanced VLSI Design Spring 2007 Introduction Vishwani D. Agrawal James J. Danaher. 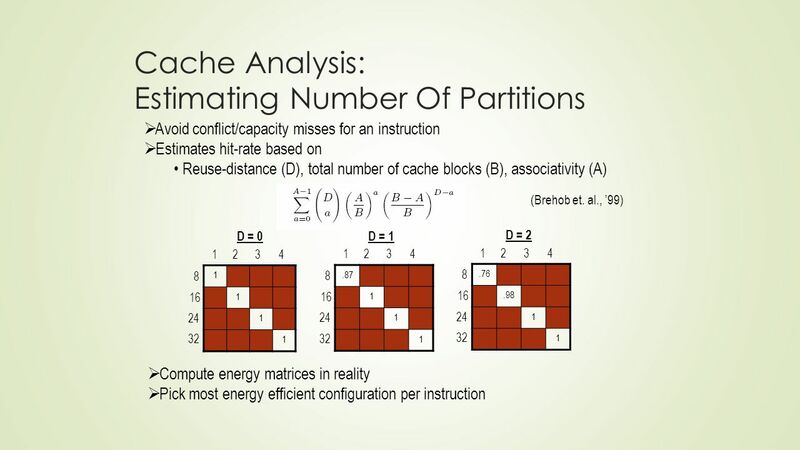 Energy Efficient Instruction Cache for Wide-issue Processors Alex Veidenbaum Information and Computer Science University of California, Irvine. 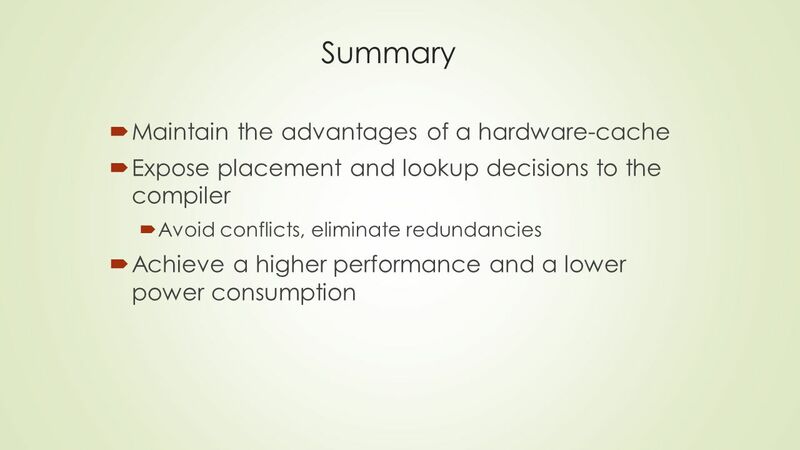 High Performance Embedded Computing © 2007 Elsevier Lecture 10: Code Generation Embedded Computing Systems Michael Schulte Based on slides and textbook.